The Red House in Aldeburgh is the former home of composer Benjamin Britten and the tenor Peter Pears. Britten and Pears acquired the Red House in an exchange for their home on Aldeburgh seafront with their artist friend Mary Potter. In November 1957, they moved in and made the Red House their own for the next 19 years. Photo by Philip Vile. The Red House, hidden away by the golf course on the edge of the Suffolk seaside town of Aldeburgh, is cherished by music-lovers worldwide as the setting for one of the greatest and most enduring creative partnerships of the 20th century - that of Benjamin Britten and Peter Pears. Photo by Philip Vile. Many of the outstanding musicians of their era visited Britten and Pears at the Red House. They included violinist Yehudi Menuhin, the cellist Rostropovich, the composer Shostakovich and the pianist Sviatoslav Richter. It was here that the annual Aldeburgh Festival was planned. Photo by Philip Vile. 4. Beware of the Dog! With all those Russian visitors, it's not surprising the 'Beware of the Dog' sign at the Red House was in Russian. This may have been hand-painted by the great cellist Rostropovich. Photo by Philip Vile. The dining room at the Red House has today been set out much as it would have been in Britten and Pears' time. Britten favoured what his housekeeper called 'nursery food', including milk pudding. Pears was more adventurous, bringing back spices and continental recipes from his travels. Photo by Philip Vile. The Red House also served as an intensely private space, acting as a retreat from the international fame and professional careers of both Britten and Pears. Photo by Philip Vile. Peter Pears was an avid collector of art and contemporary design. A 1950s screen designed by Piero Fornasetti of Milan is now on display in Pears' bedroom at the Red House. Photo by Philip Vile. An egg basket which Britten and Pears kept in the breakfast room at the Red House. Photo by Philip Vile. Britten and Pears' home is remembered as a place of great fun for visitors - young and old alike. Even HM the Queen and HRH the Duke of Edinburgh were royally entertained at the house before officially opening the Snape Maltings Concert Hall on 2 June 1967. The Red House in Aldeburgh overflows with everyday things made unique: cutlery inscribed BB, egg cups maked Pears, bed-linen and clothes identifed with name labels, souvenirs from their travels and gifts from friends. Photo by Philip Vile. Outwardly Britten and Pears lived in line with the social mores and legal necessities of their time, with their own separate bedroom suites. Photo by Philip Vile. Britten's studio was created above the garage where he kept his Rolls Royce. Today it has been restored to its original features, including authentic furniture and fittings. Over forty years, Peter Pears built up what is now a nationally important art collection of some 2000 paintings, prints and drawings. In every room the works of English Masters mingle with continental and contemporary art, while 17th century antiques rub shoulders with cutting-edge 1960s design. Photo by Philip Vile. 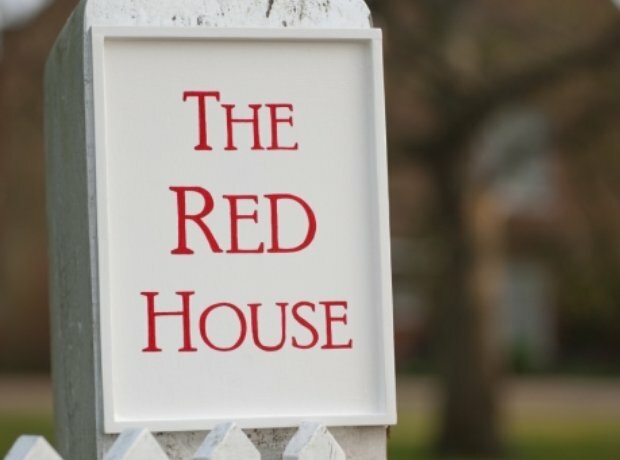 The Red House is full of the possessions that reflect Britten and Pears' domestic life and hobbies, including simple tennis rackets, travel guides, and family games. Britten and Pears loved to play tennis at the Red House.